Website and processes: 28 Jun 17 Ginny, 4/5 Good "Easy to use web site. Plenty of information." Then it is time for the walk round the aircraft - the high wing C42 is ideal for anyone with mobility problems - much like getting in a car. 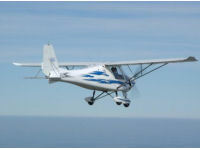 Once airborne your instructor will demonstrate the controls and once flying straight and level it will be your turn to 'take control' if you wish. This is an ideal introduction to flying a microlight to someone who has never flown before and is unsure whether they will like it or not.